Dermatol Ther. 2018 Oct 29:e12778. doi: 10.1111/dth.12778. 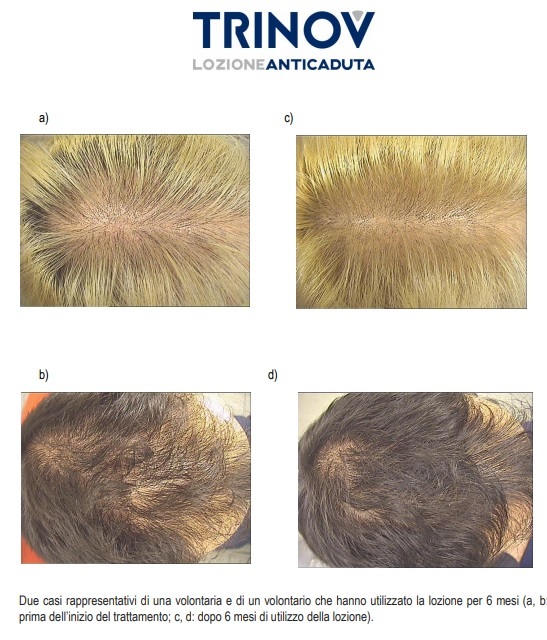 A liposome-based formulation containing equol, dihomo-γ-linolenic acid and propionyl-l-carnitine to prevent and treat hair loss: A prospective investigation. Hair loss is a common aesthetic disorder that can be triggered by genetic, inflammatory, hormonal, and environmental factors acting on hair follicles and their life cycle. There are several types of hair loss that differ in causes, symptoms, and spatial and temporal progression. Androgenic alopecia, a common form of hair loss, is the consequence of a decreased microcirculation of the scalp as well as the toxic action of elevated dihydrotestosterone levels on the hair bulbs. 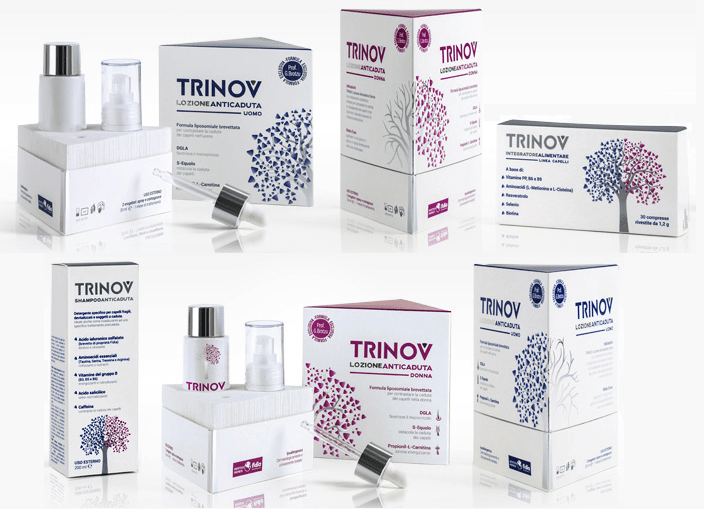 In the present study, the lotions TRINOV Lozione Anticaduta Uomo and TRINOVLozione Anticaduta Donna, containing dihomo-γ-linolenic acid (DGLA), S-equol, and propionyl-l-carnitine, were tested on 30 men and 30 women (mean age of men was 46.6±6.4 years; mean age of women was 49.5±9.0) with signs of androgenic alopecia, respectively. DGLA is a precursor of the prostaglandin PGE1, which acts by improving microcirculation; S-equol inhibits 5α-reductases, thus preventing the transformation of testosterone into dihydrotestosterone; and propionyl-l-carnitine promotes lipid metabolism, stimulating energy production. These three molecules are loaded into liposomes for their effective transdermal delivery. Daily topical applications of the lotions resulted in a hair count that significantly increased for women and marginally increased for men after 6 months of treatment. Furthermore, significant increase in anagen hair and a significant decrease in telogen hair were observed starting from 3 months in male and 1 month in female patients. Thus, the formulations under investigation were effective in attenuating androgenic alopecia-related hair loss in men and women. © 2018 Wiley Periodicals, Inc.
After six months of daily application of TRINOV men’s anti-fall lotion the increase of total number of hair is observed in 63% of subjects treated; more than 70% perceive a minor fall, improve the condition of the scalp and report feeling healthier and stronger hair. After 6 months of daily application of TRINOV Women Fallout Lotion the increase in the number total hair is observed in 90% of subjects treated; more than 70% report an improvement in the state of the scalp and refers to feel healthier and stronger hair, and almost 70% perceives one lower fall.